Make your Storyline 360 courses more accessible for hearing-impaired learners by importing closed captions for narration and videos. It’s easy. Just insert standard SRT, VTT, SBV, or SUB files. 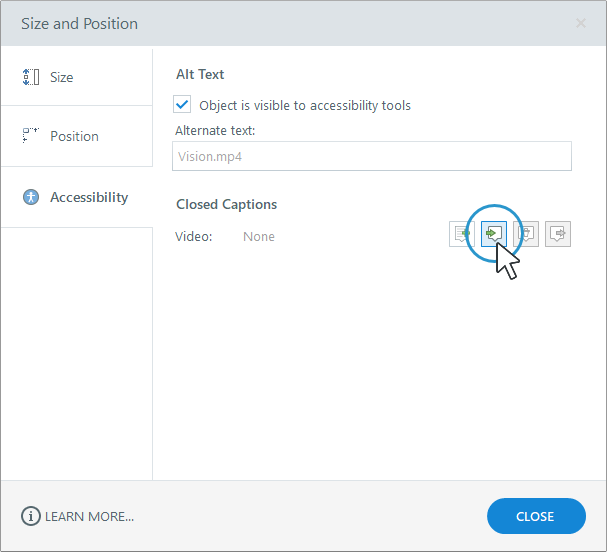 If you don't have caption files to import, you can create closed captions from scratch using Storyline's built-in editor. See this user guide for details. Storyline supports SRT, VTT, SBV, and SUB files generated by third-party captioning services, such as YouTube, Amara, and 3PlayMedia. Here are some tips to make sure your caption files are properly formatted for Storyline. A caption will automatically wrap if it’s too long to fit on a single line. However, if you need a caption to break at a specific point, add one line break in your caption file in the appropriate place. On the other hand, if you need to split a caption into two separate caption boxes that display simultaneously, add two line breaks in your caption file. You might do this when two people are speaking and you want each speaker’s dialogue to display in its own caption box. If some letters or characters in your captions are unexpectedly replaced by symbols in Storyline 360, make sure your caption files are encoded for UTF-8. Closed captions are supported for audio tracks and videos. You can import captions simultaneously with your media, or you can import captions separately. We describe both options below. If your caption files have the same names as your media files and are stored in the same folder with the media, they’ll automatically import into Storyline 360 when you import your media. 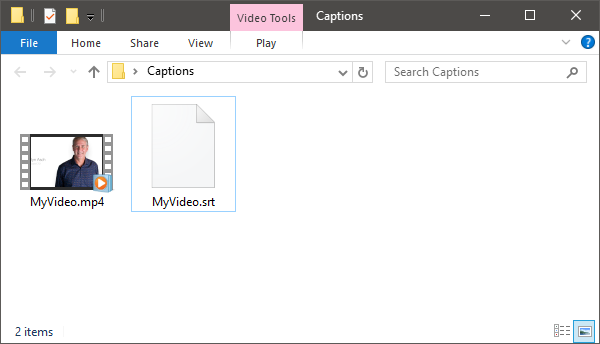 For example, if I have a video called MyVideo.mp4 and the corresponding caption file is named MyVideo.srt and is located in the same folder, I only need to import the video into my Storyline project, and the captions will automatically import and sync with the video. Select the audio track or video that you want to caption. Go to the Options tab on the Storyline ribbon and click Import. Browse to the caption file you want to import, then click Open. 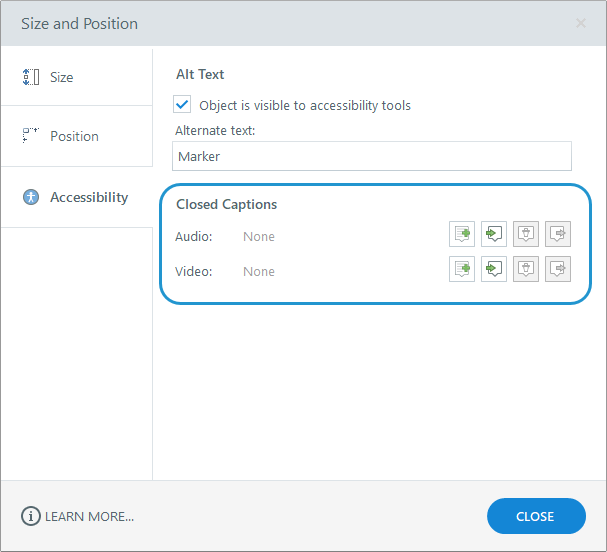 Note about captions in markers: When you right-click an interactive marker and choose Accessibility, you’ll see closed caption features for audio and video since a marker can have both types of media at the same time. Select the audio track or video that has captions you want to remove. Select the audio track or video that has captions you want to export. Choose a location where you want to save your caption file, then click Save. When the player properties window opens, click Colors & Effects on the ribbon. Use the Captions font drop-down list to select a font. Click OK to save and close the player settings. To increase the font size for captions, adjust the font size in your player properties. 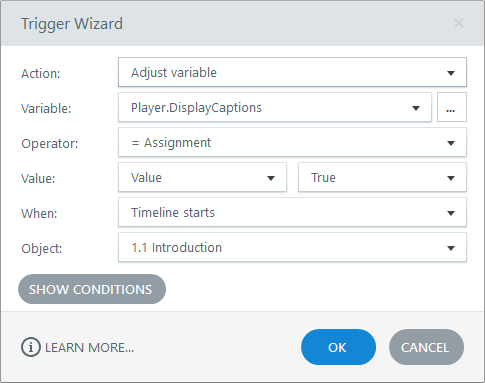 Note that this setting affects all your player features, not just captions. Increase the Player font size percentage. It can be any percentage between 75% and 200%. The closed captioning button on the course player is enabled by default, but you can disable it if you plan to build your own custom controls. When the player properties open, mark the Captions box to show the closed captioning button or uncheck it to hide the closed captioning button. The closed captioning button may not always be visible throughout your course. It’s only visible when captions are available on the current slide or layer. It’ll disappear for slides and layers that don’t have captions. This gives learners a visual clue when captions are available. When a learner clicks the closed captioning button to turn on captions, the button will remain turned on throughout the course until the learner clicks it again to turn it off. If the closed captioning button is enabled on your course player (see above), learners can toggle captions on and off whenever they want. However, you can also control captions via triggers. Just adjust the built-in Player.DisplayCaptions variable to either True (on) or False (off). 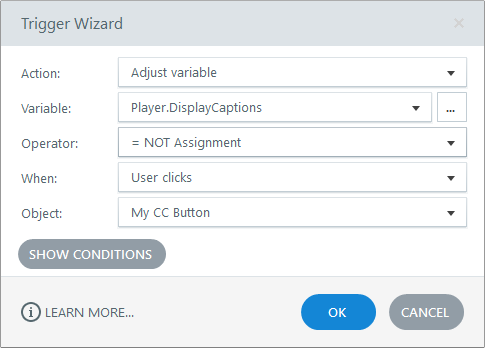 Here are a couple scenarios where you might control captions via triggers and how to set them up. Object: Select the first slide in your course from the drop-down list. Tip: You need to import at least one caption file into your project to see the built-in caption variable. Object: Select your custom button from the drop-down list.